Decorative Life: Flowers for 1-2 weeks, foliage longer. Bees love this species so be careful when harvesting. Common relatives include coleus, lavender, salvia, oregano, sage and thyme. Has small two-lipped flowers among leaves at stem ends. Resinous, linear leaves up to 1 inch long, crowded along stems up to 48 inches long. Plant is an evergreen woody shrub, classed as a dicotyledon. Flowers have some fragrance while the foliage has a spicy, intense, resinous fragrance. Can be stored at 32-41F for up to two weeks. From the Latin “ros” (dew) and “marinus” (of the sea), referring to its maritime habit. One main use is to flavor meats prior to cooking. Rosemary was burned in sick rooms to purify the air and its branches were strewn in law courts to ward off “jail fever” (typhus). 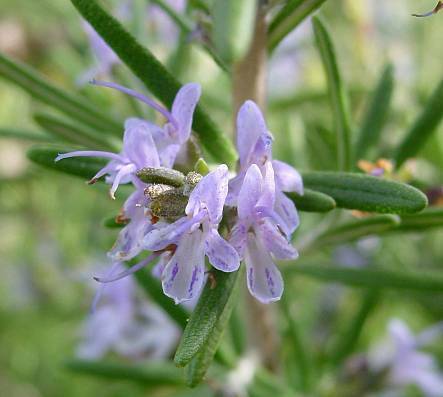 During the plague, rosemary was worn in pouches around the neck to be sniffed when traveling in stricken areas. Linen was often dried over rosemary stems so the sun would extract its moth-repellent scent. Family members are easily recognized by their square stems. Many family members are important for volatile oils used in the perfume industry. Using intact plants, Munne-Bosch et al. (2002) showed that various water stress damaged the plants. One can therefore that water stress of cut flowers would also have the same negative effect.